It has been a while since my last blog post here, but I have been busy with the TXODDS blog. I have already posted a fancy there for tomorrow, check it out by clicking here. My other fancy on Saturday runs in Ireland, and I think the step up in trip could be just what the doctor ordered for Napoleon Blue. This 6yo is trained by Adrian Murray and regular readers should know how much I respect his abilities as a handler. Sean Flanagan winning on Bilbo Bagins. Still only a 6yo, Napoleon Blue’s sole victory came in a soft ground point to point over 3 miles in October 2017. He has been brought along slowly under rules, but he was a massive eyecatcher on his fourth maiden hurdle run on his first try at beyond two miles. He stayed on really well from an unpromising position in that 19f contest, flying home for 4th, 11L behind the winner Heroesandvillains. 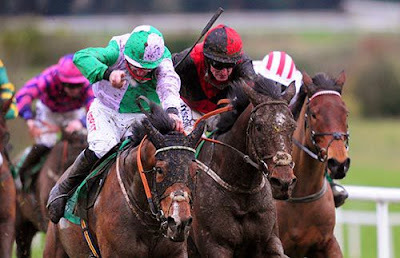 Plan Of Attack finished 3rd that day and he has since won a novice and a handicap and is now rated 122. Isle of Destiny was behind Napoleon Blue in 5th and he has since won a handicap off 107 in England. So, now off a mark of just 92, Napoleon Blue looks very dangerously handicapped on the form of that effort. He started off this season at Galway back in October off a mark of 102 over an inadequate trip of 18f and was well beaten. He didn’t run too badly next time when beaten 11L at Fairyhouse over 20f on ground plenty quick enough off a mark of 100. He was sent off at just 7/1 when upped to 21f next time at Limerick, but he ran an absolute stinker. However, it makes sense to put a line through his last few runs as Adrian Murray’s horses were badly out of form. He went a long time without a winner, but Sean Flanagan ended the drought on the well backed Bilbo Bagins at Navan on Monday. He is owned by the same connections as Napoleon Blue and Flanagan’s strike rate when riding in those colours is 50% (2/4). He is 3/11 overall when riding for Murray. His booking suggests that connections mean business on Saturday, and the cheekpieces are applied for the first time too. Off a reduced mark of just 92, Napoleon Blue is worth chancing each way at odds of 22/1.